Well, although they're not ready to go out yet...I still need to cut paper, print about 100 or so, number and sign, stuff, collate, address and send them out...But the BIG hurdle, getting a design figured out and boards cut and test printed, is done. I've pulled some proofs to adjust the woodblocks and registration and test some colors and papers so I'm basically ready to go. Now I just need a few days of damp weather and off from work. I celebrate the Asian New Year largely because, falling in February, it gives a chronic procrastinator like me another month or so to get yearly greeting cards out before I feel hopelessly and guiltily late. This year, I've had an idea of what I wanted to do for some time. In my days when I was gainfully employed, over paid and had few living expenses, I developed an interest in tribal carpets. I have a few small examples...nothing really valuable or museum quality--in part because they're just too expensive and in part because with two small children, two cats, and the occasional wool-eathing moth I never felt trustworthy as the custodian of anything really unique or valuable. But I've spent a lot of time visiting galleries of authentic tribal and village carpets and textiles and looking at examples online or in magazines and texts. The amazing color and sparkle of hand-dyed wool with natural colors when done well is just remarkable. There are incredibly rich reds, and blues, yellows and violets that when applied with the right mordants by skillful dyers made for incredible colors and vibrancy...much of it lost when synthetic colors were introduced in the late 1800s. That combined with the immediacy and graphic power of some of good examples have always really appealed to me. And since I can't really own any of these true jewel-like carpets, the idea of reproducing one in woodcut has been bouncing around my brain for a while. My thinking was that the natural pigments I use when printed on good paper have a similar sparkle and beauty that might be able to recall that of dyed wool and the quirky drawing and power of tribal carpets and textiles might be evoked with the sometimes crude marks inherent in (my) woodcuts. 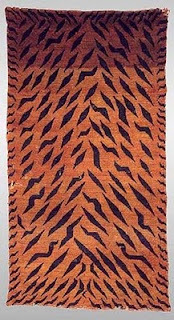 So when YEAR of THE TIGER rolled around I recalled the wonderful Tiger Pelt Carpets produced in Tibet in the 1800's. Presumably originating from the priviliged use by important persons of real tiger pelts, the practice of reproducing them in wool carpets eventually developed. Some reproduce the entire tiger on a light color ground. Others recall instead the pattered stripes in realistic or very abstract ways. Thomas Cole, who is a dealer of and writer about central asian carpets and textiles has written several articles for HALI magazine on Tibetan carpets and when I wrote him of my project and interest in finding an abstract example of such a carpet, he very generously sent me a wonderful image from one of his works. Here is a photo of the original carpet from his Hali article, "Tibetan Rugs--A Tribal Tradition" of issue 49, 1990 (republished on his website). I thoroughly encourage you to visit his website (www.tcoletribalrugs.com) and read his articles. As with most of my printed endeavors I have both succeeded and failed. My version of this carpet came out reasonably well although it is so much less beautiful than the photo of the somewhat damaged original. My cherry plank that I used for the keyblock proved a little too brittle and many of the tiger stripe points broke off during clearing of the block. So some of the delicate curviness of the original stripes--many have one or two knots as an end flourish that didn't come out in my carved block--were lost in the translation to wood. Mostly, however, I didn't yet capture either the sparkly, irregular nature of the hand-dyed wool--for once I'm guilty of printing TOO evenly! And the wonderful abrash of the carpet (the horizontal lines that come from weaving with irregularly dyed wool whose color changes batch to batch and skein to skein) didn't come out. I'm still hoping in my next round of printing to evoke that better through more careless brushing out of the pigment and letting the brushstrokes show. My version is still a little too flat and "graphic novel-looking". I've printed on Gampi, E.Kozo, and white Masa and the best color so far has been on the E. Kozo. Moku Hanga 4 3/4" X 11". Cherry Keyblock: two alder blocks; one maple block; 4 colors. AP of what should be an eventual edition of 100. Something infinite and completely irrational. Pi. The small Greek letter Pi is used to represent the mathematical constant, ever changing, derived from geometry of the circumference of a circle divided by its diameter. This ratio for any circle will always equal: 3.141592653589....and goes on forever without repeating. No pattern, just randomness as you divide it out. Supercomputers are still churning it out and have it figured out to millions of digits. My kids have memorized it out as far as they can and go around chanting the number sing-song throughout the day. Beats gum-chewing. This is my contribution to the Baren Forum exchange # 43. I was pulled in from the waiting list. While not strictly on topic--the theme was "typography"--it does include large hand-drawn/carved numbers and the Greek letter Pi prominently displayed and hand printed. Then there's also the formula for calculating the area of a circle...in case you forgot. 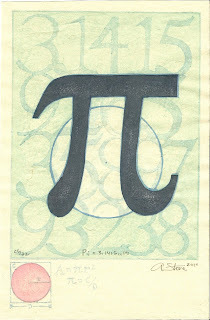 I had wanted the numbers to be visible through the ink of the "Pi" and should have printed the numbers block a bit darker or last so it would have at least embossed the damp paper. Lots of overprinting to the "Pi" as it either was too pale and lacked oomph or subject power but as it gained it by going darker I lost the effect of the numbers marching through it. At least 4 impressions and it still isn't uniform or rich enough. But the biggest defect in my mind is that I wish I'd partially drawn in the next number in the sequence so that the illusion of it continuing off page was emphasized. I'd already printed some when I figured it out and it was too late to go back. Woodblock print-moku hanga (water-based) 7.25" X 11"
Baren Exchange 43: Edition of 32; 10 various-colored Artist proofs (too many but I couldn't decide). 4 blocks; 5 colors; 8 impressions.